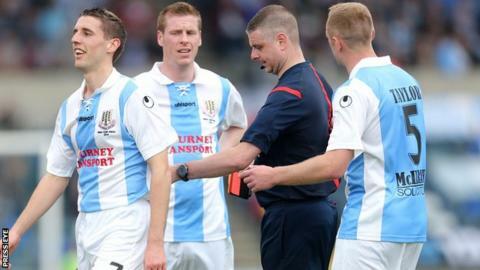 Ballymena manager Glenn Ferguson was adamant cup final referee Raymond Crangle blundered in showing a red card to Gary Thompson at Windsor Park. Glenavon's Gareth McKeown had earlier been sent-off in the match which Ballymena lost 2-1. "The referee may have got it wrong with McKeown, but two wrongs do not make a right. It was obvious Gary should not have been sent off," said Ferguson. "Sometimes in big games you get a ref who wants to be in the big picture." Ferguson admitted managers had to be careful about commenting about referees, but said he was entitled to give his views. "In my opinion Raymond Crangle got it wrong. He got what he wanted today and maybe he should have been man of the match," added Ferguson who said he had no complaints about United defender Tony Kane's late dismissal. Kane was given a straight red for a stoppage-time lunge on Glenavon player-manager Gary Hamilton. Referee Crangle gave his version of the Thompson dismissal. "Gary was sent off for serious foul play," he said. "He was challenging for the ball but was doing so in a reckless manner. "He endangered the safety of an opponent with a high tackle., his studs making contact with an opponent." For player-boss Hamilton, the result was a career highlight as Glenavon are his local team and he had supported them since childhood. "I always say, if you do not have dreams in life you have nothing, and it was my dream to win the Irish Cup with Glenavon," said former Portadown and Glentoran striker Hamilton. "My family were all watching and it is a proud moment. We are all Glenavon fans and I am so delighted we have won it. "I would have swapped everything I have achieved for this."